Huge posters hailing the historic merger of the two major factions of the Shiromani Akali Dal, which had been put up outside some of the Delhi gurdwaras last week, were removed mysteriously last night, causing considerable consternation among the members of the community. There seems to be little hope for students who could not meet the eligibility norms of the first cut-off list released here last week by the Delhi University as the second cut-off list is only marginally lower than the first one. 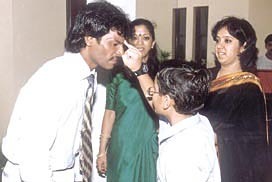 In a college compound, a boy is being made to give birth to a baby, (the helmet is stuffed into his shirt for effect), a girl with lipstick is dancing like Madhuri Dixit, and a nervous couple is getting married. Sounds familiar? For most of us, such incidents are an exercise in levity, a reminder of the fresher’s initial days in college, when ragging rules the roost. 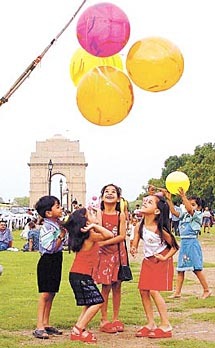 Two youths were detained near Teen Murti today for trying to cross the security barricade on the route of the convoy of Prime Minister Atal Bihari Vajpayee. The incident occurred five minutes before the Prime Minister’s convoy passed through the area. The prime minister had gone to the Army Referral Hospital for a minor eye surgery. The Gujjar community, generally perceived to be conservative, has taken a bold step which, if emulated by others, could help exorcise the scourge of dowry. A unique power house, installed about 17 years back by the Non Conventional Energy Resources Ministry at Nehru Vihar near Wazirabad in North East Delhi, has been reduced to junk, thanks to the negligence of the authorities. The Haryana unit of the Yuva Samata Party, the youth wing of the Samata party, has decided to enroll 20,000 active members in Haryana. Addressing a press conference here yesterday the party’s state president Mr. Amit Lamba informed that the YSP membership drive would be formally launched at Rohtak by Mr Shiv Kumar, National General Secretary of the Samata Party. Mr Samsher Singh Surjewala, a former Haryana minister and a senior Congress leader accused the Chief Minister of making false statements on the issue of the construction and completion of the SYL canal in the Punjab territory. The Institute of Marketing and Management in collaboration with IIPA and NIUA is organising a unique and first of its kind national conference on “Management and Marketing of Municipal Services in India”. The All India Citizens Committee today demanded a white paper on the civic amenities in the J.J. and resettlement colonies in the Capital. Addressing a meeting here in Tilak Nagar, Sardar Raja Singh Sethi, secretary of the Citizens Committee, alleged that the government had failed to provide the basic civic amenities to Delhiites. The General Secretary of the Haryana Vikas Party Mr Rajiv Jain has demanded reservation of the old civil hospital land for holding public rallies and social functions instead of establishing a shopping complex there. The state government has failed to honour its promises of providing sufficient canal water for irrigation to farmers in this district. Despite several complaints to the authorities, the farmers here are facing acute shortage of canal water. The supply of canal water is insufficient even during rotation period, the farmers say. Ten persons were injured in a clash between two groups concerning the division of land in Rabupura village. According to police, the land in Syana village was being divided between Chattar Singh, S/O Ram Singh and Brahmpal Singh S/o Ram Singh yesterday. A CRPF jawan Sanjeev Kumar, who had sacrificed his life in an encounter while fighting the terrorists in a sensitive area of Tripura, was cremated with full honours here. The district unit of Akhil Bhartiya Janwadi Mahila Samiti has constituted a ‘Dahej Virodhi Manch’ (anti-dowry platform) with a view to curbing this malpractice. The manch was constituted during a meeting held here today which was attended by several activists of social and apolitical organisations. A 16-year-old class X student Urmila was reported to have committed suicide by hanging herself with a ‘chunni’ in the house of a relative at Saboli village about 15 km from here yesterday. One person was killed and 10 including five women were injured when a truck hit a canter from the rear side on G T Road near Garhi Kalan village about 30 km from here last evening. According to a report, the injured were on their way to Karnal by a canter. The canter was stopped near Garhi Kalan village for taking more people on it. Le Bon, a specialty cheese brand has launched a delicious range of Cheddar Processed Cheese. This cheese has an authentic taste of cheddar and its firm texture makes it suitable for grating. The cheese can be used for a variety of preparations such as sandwiches, cocktail canapes, salads and soups. SPORTS fields in schools are the breeding ground for talent. Encouragement and instruction during the formative years, added to the zeal and the dedication to perform are the formula for churning out a sportsperson. To search for talent in the country’s sheer number may not be so difficult, should the authorities get down to the task honestly. Indian hockey captain Dhanraj Pillai being welcomed at the Heritage School, Gurgaon. YOUNGSTERS have tremendous energy, which needs to be drawn together and channelled in the right direction to help them realise their constructive potential, build power of concentration to face challenges and override all difficulties to reach the pinnacle of success. Aiming to provide education to all, the district administration has set a target to enrol 893 more students in the primary classes this year. For this, the education department has announced to launch a special drive in the Hathin block of the district. Medical excellence awards were today given to several doctors at a function held here today to earmark the Doctor’s Day on July 1. 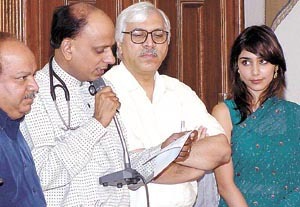 The function was jointly organized by IMA, Delhi Police, IJCP group of publications and Heart Care Foundation of India. Medical awards being given to mark the Doctor’s Day on July 1st. Punjab Heroes hit back to hold Young Bengal Association to a 2-2 draw in a Group I match of the Delhi Soccer Association B Division Open Clubs Football League Championship at the Ambedkar Stadium on Sunday. Jalad Dua played a fine all round role, scoring an unbeaten 42 off just 33 balls and then taking two wickets for nine runs to help Lal Bahadur Shastri Club beat Sonnet by 49 runs and annex the first Turf Youth Cup Under-15 Cricket Tournament at the Bharat Nagar ground. Himansh P Kala and Shikha Sharma annexed the men’s singles and women’s singles titles in the inaugural Champion Cup Prize Money Table Tennis Tournament at the Talkatora Indoor Stadium on Sunday. A strokeful 78 by Sumit Kundu and a quickfire 46 by Veer Bahadur helped Bright Club beat Delhi Eaglet by 15 runs and entered the quarter-final of the DDCA Under-15 Cricket Tournament at the Kalindi College ground. Pinki Beniwal swam her way to victory in three categories of the Siti cable and ESPN organised swimming championship in Sector 14 here today. Pinki emerged the winner in the 50mt. freestyle and breaststroke in the sub- juniors category and in the 50mt. breaststroke in the juniors category.